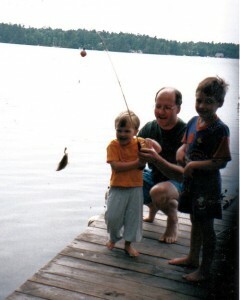 I had enjoyed fishing as a kid and an adult, which was one of the reasons we chose a place on Watchic Lake. I have lots of fond memories of fishing with my two sons, but this one is special as my youngest son had just caught his first fish. This was about 1995.